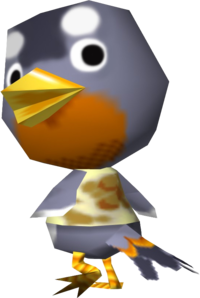 Otis is a lazy, bird villager from the Animal Crossing series. His name, Otis, may have something to do with bird-feed, usually composed of seeds or oats. His Japanese name, Takuan, is the name of a dish made with a pickled daikon radish. Otis is a gray bird with two white spots, which could be his eyebrows. His chin is orange, like a robin's and he has a white chest and wingtips. He has an orange bill and feet, and orange feathers on his tail, which ends in the same color as his forehead. When he first moves to the town, he will wear the Moldy Shirt, a shirt designed by Gracie. Otis has a lazy personality, meaning he will mostly talk about food, sleep and superheroes. He may offend jock villagers due to them always exercising, and lazy villagers always relaxing. Cranky villagers will admire their laid-back lifestyle, but Otis may also offend snooty villagers due to them caring about their weight. If he asks the player to give him clothes, he will often mention Fashion Lad, a superhero invented by lazy villagers. Otis's house has some pieces from the Mossy Garden Theme, including a Deer Scare and a Garden Pond. He also has a Scary Painting and several gyroids. His does not own a stereo, which means he will not play any music in his home. The distinctive patch of orange plumage on Otis's chin makes it look like he has a beard, but don't mention it to him. See, Otis has been going gray for quite some time, and he's kinda touchy about it. Modified on March 11, 2019, at 00:48.